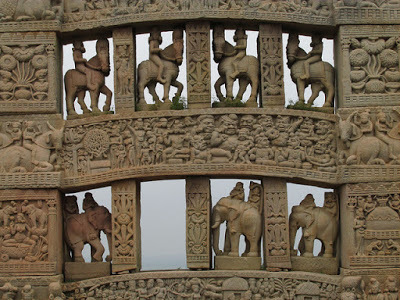 Gateway to the Great Stupa at Sanchi, 1st century CE. Synopsis: The life (well, lives) of the Buddha are almost naturally suited to graphic storytelling. After all, Buddhist jataka tales and stories of his birth and death have been illustrated in visual form on architectural monuments for centuries…even millennia. 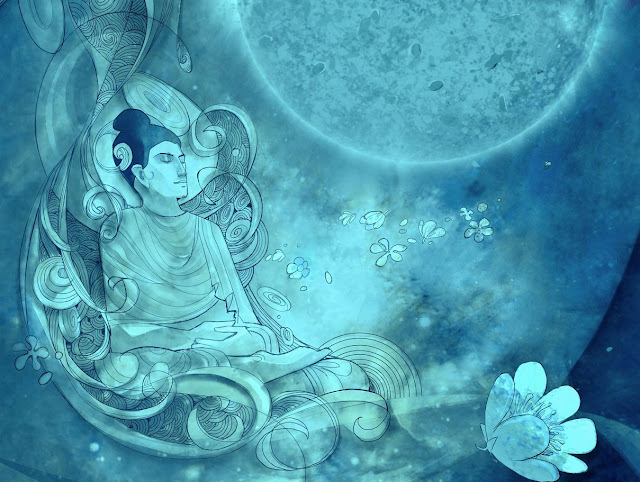 They come with their own visual conventions and pictorial traditions, so it is interesting to tackle a depiction of the Buddha’s life in a contemporary comics format, taking an ancient visual language and blending it with one that current readers are familiar with. The graphic novel Buddha: An Enlightened Life by Kieron Moore and Rajesh Nagulakonda covers the story of how the Buddha became the Buddha: how a minor noble named Prince Siddhartha experienced a great spiritual awakening, abandoned his princely life, and wandered as a pauper before reaching enlightenment and establishing one of the world’s great religious traditions. This intriguing and educational book was a finalist for Cybils Young Adult Graphic Novels this past year. Observations: This book does a great job of bringing to life the story of how Prince Siddhartha became the Buddha, animating his various trials and life events with a sense of drama and even adventure. 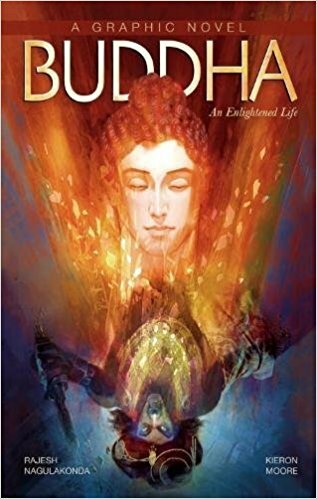 While there is a distinct whiff of the “educational” with this one, and some young readers might simply not be interested in the topic, the story of Buddha is international and timeless, and an important part of world culture as well as the culture of many young readers. The drawing style is beautiful and the colors ethereal, bringing a visible Asian flair into a traditional, easy-to-read comics layout. I kind of wish it hadn’t followed the Victorian-era convention of making everyone fair-skinned, though; fair skin is considered a favorable trait in Indian culture, but it is also a symptom of a pernicious colorism that perpetuates the damaging class divides of the caste system. All that aside, though, the art was really quite lovely, and its delicacy fitting for a story about spiritual enlightenment. Conclusion: I’ve been wanting to explore Campfire Graphic Novels for a while now, interested in what might emerge from a homegrown comics publisher in India, and the educational value and overall quality of this one has me eager to read more. I appreciate the effort being made by this Indian imprint to produce high-quality literary titles to be marketed to English-speaking audiences around the world. I received my copy of this book courtesy of the publisher for Cybils 2017. You can find BUDDHA: AN ENLIGHTENED LIFE by Kieron Moore and Rajesh Nagulakonda at an online e-tailer, or at a real life, independent bookstore near you! This work is copyrighted material. All opinions are those of the writer, unless otherwise indicated. All book reviews are UNSOLICITED, and no money has exchanged hands, unless otherwise indicated. Please contact the weblog owner for further details.